Fun and More with iPhone 4! 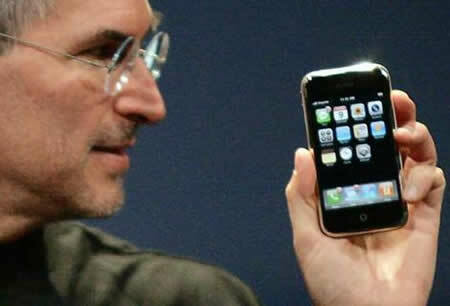 The iPhone 4, slated for release in the U.S., UK, France, Germany and Japan on June 24 ($199 for the 16GB model and $299 for the 32GB model with a two year AT&T contract) is some 24% thinner and corrects many shortcomings of the current models. New features include multitasking, a new 3.5-inch “Retina” display with 4 times as many pixels as the iPhone 3GS and an aluminosilcate glass casiing. Its 5 megapixel front facing camera with a 5X digital zoom is capable of shooting HD video and enabling face-to-face video calling. The new 3-axis gyro provides 6-axis motion sensing for gaming developers, opening the door to a whole new generation of accelerometer-powered games. The phone runs on the iOS 4 operating system, boasting the ability to finally organize your apps into folders. However, not all went so Apple-smoothly when Jobs demonstrated the phone to an audience of reporters, product reviewers, and Apple fans (and competitors). He lost his WiFi connection in the middle of his spiel. About 20 or 30 minutes into the big iPhone reveal, the Wi-Fi network that Jobs was using to show off Web browsing on the iPhone 4’s revamped screen conked out, leaving Apple’s normally poised, ultra-confident CEO a bit red-faced as the audience stared at a giant blank Web page. “Our networks in here are always unpredictable. They are slow today,” said Jobs, as he waited, and waited, and waited. No dice. Then Jobs asked the audience for a little assistance. “You know, you could help me out if you’re on Wi-Fi, if you could just get off. … I’d appreciate it.” Naturally, the members of the audience — probably half of whom were furiously live-blogging away — roared with laughter, and the guffaws only grew louder when an error message popped up reading “could not activate cellular network.” AT&T, anyone? “Yep, I know that,” Jobs replied testily, as the wireless problems dragged on for another minute. “Well, geez, I don’t like this. I’m afraid I have a problem and I won’t be able to show you much here today,” groaned Jobs, who finally resorted to showing off high-resolution photos from the iPhone 4’s photo roll, to some appreciative applause. Of course, some snarky goofball in the audience just couldn’t resist. “Verizon!” the guy shouted, and the audience roared again. Anyway, within another minute or so, the Wi-Fi was back, and Jobs moved on, albeit with the occasional plea to members of the press to please, please turn your Wi-Fi off.